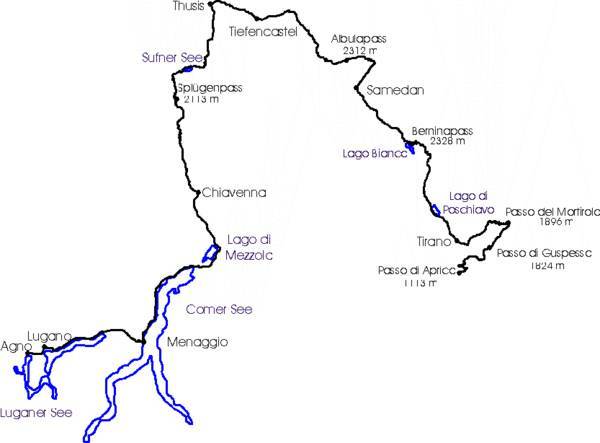 Starting around the usual 8.30-9.00am, the run through Lugano was quick...crossing into Italy after a blat along the north-shore of the lake, tacking east to Porlezza. Here the rain caught up with us again, time for the wet-gear to come out. 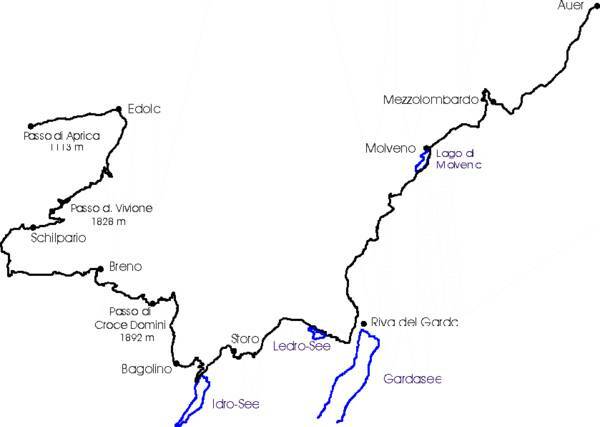 From Menággio on Lake Como, it’s up the left shore via Dongo and Gravedona to the head of the lake, then north to Chiavenna for a left turn up the Splügenpass (2113m), where the rain decided it had eough for the day. The downhill stretch offered itself for a photo-session, getting some great shots of Lothar and Werner through the maze of hairpins. After the fill-up in Thusis it’s off to Tiefencastel weiter zu fahren. After lunch at Surava (the Gasthof is right next to the road, very recommendable) the Albulapass (2312m) waited with a surprise...zooming downhill at a great rate of knots were some scooter-riders...the type of foldable scooter with the tiny 3“ wheels. First Samedan, then Pontresina on the way across the Berninapass (2328m) and from Poschiavo to Brusio, where the local narrow-gauge Railway does a complete loop, crossing below itself on its way south. Turning left in Tirano to Mazzo di Valtelino, where the Passo di Mortirolo (aka Passo della Foppa) (1896m) starts off....another one of my favourites and a definite highlight NOT to be missed. Turning right at the top onto the tiny Passo di Guspessa (1824m, up to 25% drop), the way leads back down into the valley. Turn right for the Passo di Aprica (1113m). Werner and Lothar knew the camp site here ...and Dietmar had the dubious pleasure of cleaning out the topcase once more, this time is was the garlic-sauce that’d popped the top. A quick stab east to Edolo then south to Forno Allione for the turn off across the Passo di Vivione (1828m), another superb bike-road, but VERY narrow. Not seeing much traffic, the road follows the rock cliff on the way down...very exposed....to Schilpário. Towards Bagolino and about 10km short of town my mirrors were empty...Waiting a few minutes, I turned back just to find Dietmar and the others at one of the bends. Dietmar hadn’t kept top the far right and clipped an oncoming car with his left pannier, the bike glanced into the rock on the right, removing the other pannier and crashbar....but luckily body-damage was minimal, nothing apart from a decent bruise on the lower leg. The material-damage was sizeable, though...and the police rolled up shortly after for a report, placing Dietmar squarely in the wrong, hmmmm...things certainly would’ve turned out differently if Dietmar had stuck to the far right, but to place the „at fault“ solely on his shoulders at such a narrow road?? Revisiting the spot a forthnight later I measured the width of the road as 10 feet in total. Dietmar enquiries afterwards to possibly change those findings before a court in Italy didn’t look too promising either. Luckily the right pannier was still usable and Dietmar was able to continue. Turning right in Bagolino to Lago d’Idro, we turned north to Lodrone for a, by now, late lunch and we decided to quit the day’s riding at Auer, south of Bolzano. Going on through the Ledro Valley we turned right before the tunnel leading to Riva di Garda to use a small backroad which sadly finished in Pregásina (beautiful spot). Later I discovered the road I’d been after from a lookout at the opposite side of Lake Garda. Despite that, the road is reported to be closed for motorized vehicles, a pity, as it’s a real twister in stunning surrounds. 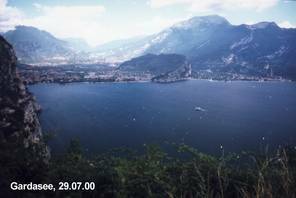 Short of Riva di Garda we turned left to Lago di Tenno to get to Ponte Arche and Molveno. Turning right in Andalo (just after Molveno) it’s across to Mezzolombardo and finally onto the Trento –Bolzano main road. führt. Auer wasn’t far off as it started to rain 2km short of the target. Only a short shower though....as we pitched tents in the dry. The well-known hospitality of Paula and Markus at the Camp site was a welcome end to the day. To recoup some of the time we’d squandered along the way, we decided to to change plans and streamline our route through the Dolomite Mountains, still using the byways and backroads for the run across the Staller Sattel. Through Bolzano and up the Sarn Valley, turning right towards the Ritten Mountain, climbing steeply into Klobenstein for the obligatory Cappuccino-Break. 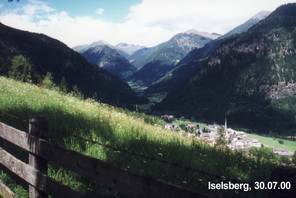 Via Lengstein to Barbian....enjoying the views into the Eisack Valley along the way. A short left-right on the valley-floor and steeply uphill to Lajen. Then along a narrow but very scenic stretch to Gufidaun and into the Villnöss-Tvalley. Turning left in Sankt Peter and up the Kofeljoch (1863m) followed by the Würzjoch (2004m). The Furkelpass (1759 m) was next, after the left turn to Welschen and Zwischenwasser turning right to St. Vigil. Dropping into the Puster-Valley it was another quick right-left for the entry to the Antholzer-Valley, with the Staller Saddle at the end of it. We had to make it a bit of a rush, to catch the alloted time-slot for the alternating-30 Minute usage of the single-lane section....otherwise it’d be another hour of wait for the next time-slot. So it was full-steam up the valley and we hit the gates at Antholzer Lake with only 3 Min. to spare to make the Staller-Sattel (2052m) crossing into Austria. A short stop at the top was the start of a leisurly cruise down the Defereggent Valley. Via Sankt Jakob and Sankt Veit , turning right into the Tauernt Valley and the city of Lienz. Across the Iselsberg (1204m) and Winklern to Heiligenblut at the Großglockner. After paying the toll of 230 Austrian Shillings it was up one of the ‚crown“-roads of the Alps, the Großglockner-Hochalpenstraße. The starting rain dropped a little ‚fly in the soup“ as we climbed the Franz-Josefs-Höhe and on the way to the Hochtor (2575m). The higher we climbed, the more the landscape turned to white...as rain turned into snow. Things turned decidedly uncomfortable as the snow depth continued to grow...time to turn back and go south, through Carthania. The wet-gear came off shortly after Heiligenblut as the skies broke up and turned blue....on towards Winklern, for a left turn onto the B106. Through Außerfragant, Obervellach and Mühldorf to Möllbrücke ending the day here, as the camp area occupies a nice setting and has a good kitchen, despite the next morning’s traffic noise coming off the B106. 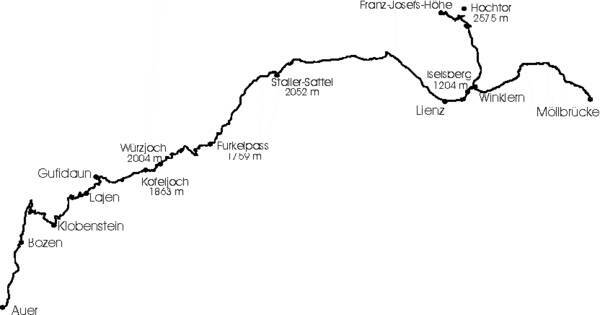 Monday morning found us tracking north to Spittal and Gmünd to Kremsbrücke, start of the Nockalm- Road , which winds itself through the National Park Nockberge, climbing above 2000m (Eisentalhöhe 2015 m and Schistlscharte 2042 m) to end at the town of Ebene Reichenau. Tacking south, we turned off west to Bad Kleinkirchheim and left again in Radentheim onto the B98. Past Brennsee and Afritzer-See to the turnoff to nach Villach hitting some stop-go traffic due to roadworks. Towards the Wurzenpass machten it was time for a break, and the Pizzeria at the turnoff turned out to be a good find...highly recommendable. Not just a great Pizza, but the portions were humungous. Across the Wurzenpass (1073m) into Slovenia and Kranjska Gora, turnoff for the 50+ hairpins of the Vršič-Pass (1611m) ab. Bovec and Kobarid were next, an area that reminded me of the Karl May book „The Gorges of the Balkans“. Past Tolmir onto route 403 to Kneža and Koritnica to Podbrdo . An easy find was Bohinjská Bistrica and a right right turn after Bled to Radovljica. A small backroad leads through Zapuže and Zgoša to Bistrica, start of the Loiblpass (1367m) and straight into Klagenfurt. There’s a big Honda dealership at the edge of town and they were friendly enough to change my worn brake pads the next day. 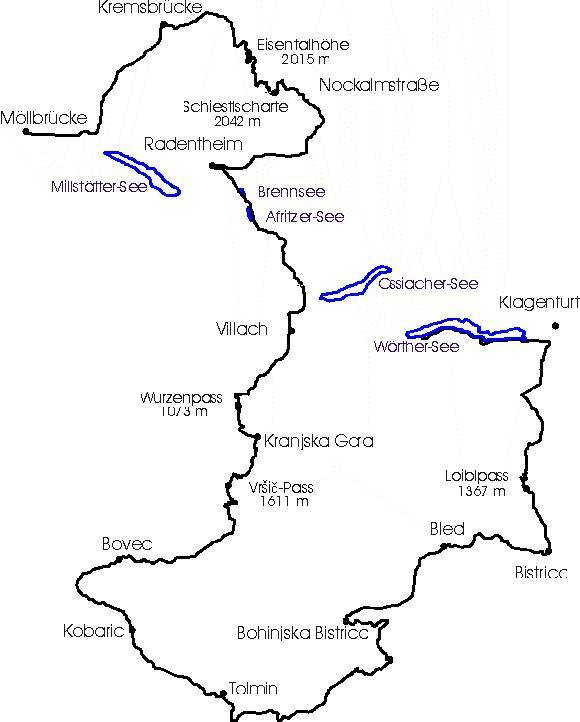 The search for a camp site along the shores of the Wörthersee became a bit more drawn out than planned, but finally succeeded near the head of the lake.